Heritage UMC in Broken Arrow lists 10 ways your church can use Facebook for outreach. 1. Create a church Facebook page and encourage congregants to "Like" the page. 3. Encourage congregants to "Check-In" on Facebook when they arrive at worship or any other church event. Remind them to tell others via Facebook about the church they love AND INVITE OTHERS. 4. Know your target audience, and create and post events that will interest the people you want to reach. 5. Choose your search terms carefully. When you create a Facebook Event, you are given an opportunity to add search keywords. Choose keywords that are specifically designated to reach your target audience. 6. Regularly post positive messages about what is happening at your church as well as create Event pages for specific activities. 7. Remember to share your Facebook posts with all relevant groups (i.e., Community pages, Neighborhood Association pages, Local Buy/Sell pages). 8. Post often! 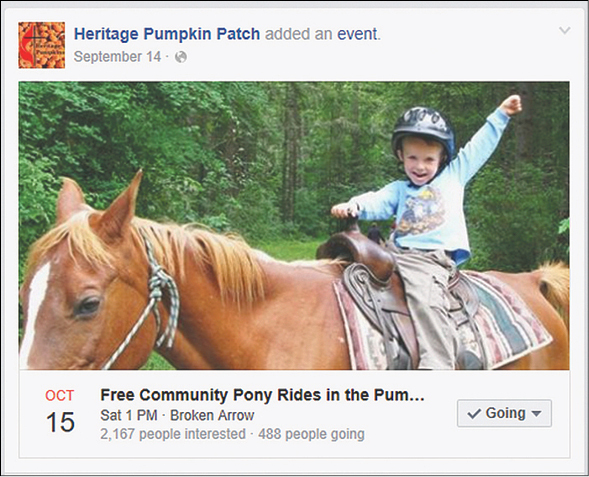 Heritage began posting its Pumpkin Patch events three weeks prior to each one and reposted variations of that invitation at least every other day. 9. Post at different times of the day. (You can schedule that through Facebook.) Not everyone checks Facebook at the same time each day.